Air Canada Flight 624 crash: 'Hard landing' too soft a term? FRANKFURT, Germany (AP) - Lufthansa knew that the co-pilot of the passenger plane that crashed in the French Alps last week had suffered from an episode of "severe depression" before he finished his flight training with the German airline. The airline said Tuesday that it has found emails that Andreas Lubitz sent to the Lufthansa flight school in 2009 when he resumed his training in Bremen after an interruption of several months. In them, he informed the school that he had suffered a "previous episode of severe depression," which had since subsided. The airline said Lubitz subsequently passed all medical checks and that it has provided the documents to prosecutors. It declined to make any further comment. 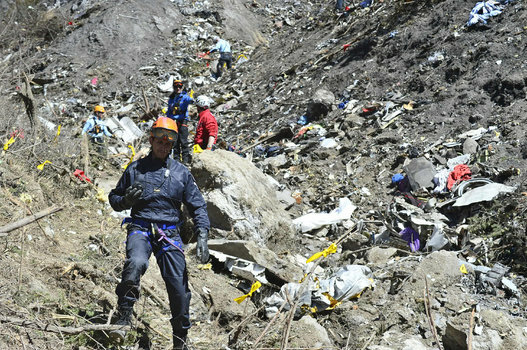 French authorities say voice recordings indicate Lubitz, 27, locked the other pilot out of the cockpit and deliberately crashed the Airbus A320 in the French Alps on March 24. All 150 people aboard Flight 9525 from Barcelona to Duesseldorf died. The disclosure that Lubitz had told the airline he had suffered from depression before he was hired in September, 2013 at Lufthansa's budget arm Germanwings is another blow to the company's reputation. Lufthansa CEO Carsten Spohr had said that Lubitz passed all tests and had been pronounced fit to fly. The revelation adds to questions about how much Lufthansa and its insurers will pay in damages for the passengers who died. It also underlines questions about how thoroughly the aviation industry and government regulators screen pilots for psychological problems. German prosecutors say Lubitz received psychotherapy before obtaining his pilot's license and that medical records from that time referred to "suicidal tendencies." They have given no dates for his treatment, but said visits to doctors since then showed no record of any suicidal tendencies or aggression against others. They also have found torn-up sick notes from doctors, including one that would have kept Lubitz off work on the day of the crash. The latest disclosure "really does suggest a potential problem with the airline's oversight of this aviator," says Alan E. Diehl, a former air safety investigator with the NTSB and a former scientist for human performance at the Federal Aviation Administration. Diehl says the global shortage of pilots might be leading to lax hiring standards. Every week, there are nearly 30 new jets rolling off assembly lines. Each one requires airlines to hire and train at least 10 to 12 new pilots. "Maybe some of these carriers, not just Germanwings, are taking people that they wouldn't normally take," Diehl says. In the U.S., the Federal Aviation Administration in 2010 starting allowing some pilots who are taking medication for mild to moderate depression to continue flying on a case-by-case basis. Pilots taking drugs like Prozac, Zoloft, Celexa and Lexapro were allowed to fly if granted a special medical certificate. One prerequisite was the successful treatment on the medication for at least 12 months. Dr. Warren Silberman, manager of medical certification for the FAA until the end of 2011, said pilots in the U.S. can fly again even after having suicidal thoughts. "It really would depend on what the psychiatrist or psychologist that he saw wrote, and what his symptoms were," Silberman said. "The minute he declares he is depressed, he is grounded. And if he goes on medication, he's definitely grounded." After treatment, "If you were doing better after the depressive episode and the (doctor's) note was favorable, then the FAA would likely clear you," he said. Admitting suicidal thoughts would probably mean a longer period of being grounded, and the pilot's case would probably wind up in the hands of the FAA's chief psychiatrist in Washington, he said. Silberman said that over time pilots become more willing to discuss their mental state with their doctors, and there are employee-assistance programs to help them. Still, pilots often hide their medical problems. The fact Lufthansa knew of Lubitz's illness only worsens the airline's legal position, even if cases are settled and not brought to trial. Airlines on international flights are required to compensate relatives of victims for proven damages of up to a limit of about $157,000 - regardless of what caused the crash. However, higher compensation is possible if a carrier is held liable. "I think as a practical and legal matter Lufthansa is at this point liable for the accident," said Brian Alexander, an international aviation attorney with Kreindler & Kreindler in New York. "This makes the case, which was already indefensible, even more so," said Jonathan C. Reiter, a U.S. attorney who has represented family members of a person who died in a 1999 EgyptAir crash investigators say was caused by the co-pilot, as well as people aboard a 2012 JetBlue flight where the pilot had a mental breakdown and had to be restrained. That flight landed safely. "They're responsible. That's the end of it," said Reiter. "They can't say, we couldn't possibly have known. They did know." In Frankfurt, Lufthansa spokeswoman Kerstin Lau said insurers have already reserved $300 million to deal with "all costs arising in connection with the case." Lufthansa offered immediate aid last week of up to 50,000 euros ($54,250) per passenger to relatives of the victims. Those payments are separate from eventual compensation payments. Germanwings CEO Thomas Winkelmann and Lufthansa CEO Carsten Spohr speak at a press conference as they visit the air crash memorial in Le Vernet, south-eastern France. Lufthansa's chief executive said Wednesday it will take "a long, long time" to understand what led to a deadly crash in the Alps last week - but refused to say what the airline knew about the mental health of the co-pilot suspected of deliberately destroying the plane. Lufthansa CEO Carsten Spohr and the head of its low-cost airline Germanwings, Thomas Winkelmann, were visiting the crash area Wednesday amid mounting questions about how much the airlines knew about co-pilot Andreas Lubitz's psychological state and why they haven't released more information about it. The two men lay flowers and then stood silently facing a stone monument to the plane's 150 victims. The monument looks toward the mountains where the Germanwings A320 crashed and shattered into thousands of pieces March 24 and bears a memorial message in German, Spanish, French and English. Spohr said the airline is "learning more every day" about what might have led to the crash but "it will take a long, long time to understand how this could happen." He then deflected questions from reporters at the site in Seyne-les-Alpes, and drove away. After listening to the plane's voice data recorder, investigators believe Lubitz intentionally crashed the plane. Lufthansa acknowledged Tuesday that it knew Lubitz had suffered from an episode of "severe depression" before he finished his flight training at the German airline, but that he has passed all his medical checks since. German prosecutors say Lubitz's medical records from before he received his pilot's license referred to "suicidal tendencies," but visits to doctors since then showed no record of any suicidal tendencies or aggression against others. The revelations intensify questions about how much Lufthansa and its insurers will pay in damages for the passengers who died - and about how thoroughly the aviation industry and government regulators screen pilots for psychological problems. At the crash site Wednesday, authorities said they have finished collecting human remains. "(We) will continue looking for bodies, but at the crash site there are no longer any visible remains," said Lt. Col. Jean-Marc Menichini. Lt. Luc Poussel said all that's left are "belongings and pieces of metal." Officials at France's national criminal laboratory near Paris say it will take a few months for the painstaking identification process to be complete and for the remains to be returned to the families. R�gis Le Sommier, the deputy editor of French publication Paris Match, says he believes that a video apparently showing the chaotic final seconds on board the Germanwings flight is authentic. "I'm convinced this is real," Le Sommier told TODAY's Savannah Guthrie. "We are pretty positive about our source, which is close to the investigation team, so there is no doubt that what we saw are the final seconds of what happened." A French police official told NBC News that the cell phone video appeared to be "a fake." "The footage is very blurry, but the sound...there's no doubt the passenger knew what was going on inside and knew what was going to happen," Le Sommier said. None of the family members of the passengers have reached out to the publication about the video, he added. "Not yet. Under my knowledge at the moment, I don't think so," he said, stressing that the publication doesn't actually possess the video. Lufthansa, the parent company of Germanwings, on Tuesday acknowledged it knew that pilot Andreas Lubitz had suffered from severe depression. Investigators believe Lubitz deliberately crashed the jetliner into the French Alps. 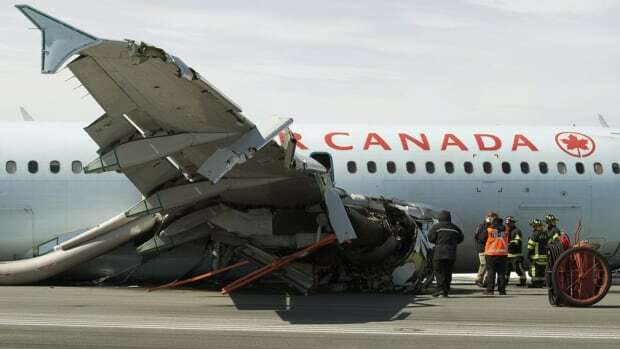 No matter what you call it, Air Canada Flight 624's "hard landing" was a dramatic event, resulting in collapsed landing gear, a ripped-off engine and a severed nose cone after the jet began its skid 335 metres short of a snow-strewn Halifax runway. Even so, hard landings are hardly extraordinary, say aviation experts. Any frequent flyer has likely felt one, or maybe even slept through the experience. It's another matter, though, when the touchdown wrecks a plane or causes 25 passengers to be hospitalized, as it did on Sunday, says Gordon Dupont, a former accident investigator with the Transportation Safety Board. 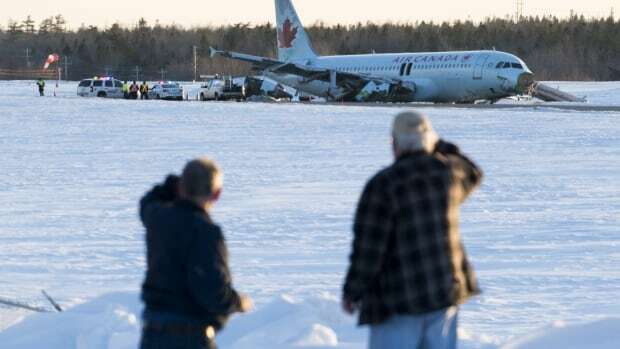 On Monday, the Transportation Safety Board of Canada issued a release describing Sunday's Air Canada Airbus A320 crash as a "collision with terrain" rather than as a "hard landing," the term used by officials with Halifax Stanfield International Airport and Air Canada. But, as Dupont sees it, employing hard landing in this instance is a bit soft. "It's like a teenager comes home and says, 'Dad, I put a little dent in the car,' and the dad comes out and the whole side of the car is wiped out," he says. "It's baloney. If the pilot didn't intend to land there, that, to me, is a crash landing." The Transportation Safety Board of Canada lists 21 hard-landing aviation investigation reports since 1994, many involving helicopters. The most recent occurred in May 2013 at Sault Ste. Marie, Ont., and two of the 21 involved Jazz flights, the budget service operated by Air Canada. Only hard landing accidents that result in aircraft damage, injuries or fatalities are recorded by the TSB. And pilots pull off hard landings every day, often deliberately at smaller airports with shorter runways, Dupont said. Landing gears, in fact, are designed to absorb firm touchdowns. In an ideal landing approach, Dupont explained, the pilot pulls the nose up when the plane is a few feet above the runway, letting the main gear "kiss" the tarmac and glide to a smooth rest. A hard landing occurs in the "flaring" stage when the nose pulls up too soon at the final approach, making the aircraft crunch down. "If you've ever been through a landing that comes down with a thump, there's no damage or anything, but the pilots are saying, 'Damn, we just had a hard landing,'" said Dupont, who worked as an accident investigator for seven years before joining Transport Canada. "It happens often, and it happens to good pilots." 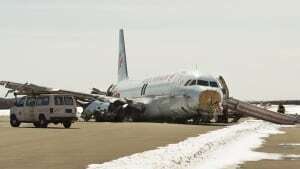 For its part, the Airline Transport Association of Canada dismisses the term "crash landing" as an oxymoron. "It's either a crash or it's a landing," said president John McKenna. "We don't think there's such a thing as a 'crash landing.'" Following unusually bumpy landings, a carrier's on-board electronics will log whether the plane is in need of maintenance, but McKenna said commercial pilots also have an obligation to report abnormal landings. Aviation lawyer Arthur Rosenberg suspects officials with Halifax Stanfield International Airport and Air Canada have been choosing their words carefully to downplay the aviation scare as something more mundane than what's shown in photos. Flight AC624 was carrying 133 passengers and five crew members when it smashed into an antenna array and clipped power poles before scraping along the ground on its belly. Passengers were treated for minor cuts and bruises. "The plane was demolished," Rosenberg said from his New York practice. "A collapsed nose gear, collapsed main gear, bulkhead buckling, I can see the ripples from the skin on the leading edge of the airplane. Putting that all together, that was a crash landing." In 1997, Air Canada staff at the wreck site of Flight 646 painted over the carrier's logo the day after it lost control and slammed into a tree on arrival in Fredericton. Of the 42 people on board that day, nine were seriously injured in the accident. TSB later classed it as a "loss of control on go-around" or "rejected landing" event. The safety regulator describes other accidents as "crash on take-off," or "collisions" with terrain, trees and water. The framing of Sunday's accident as something other than a crash is likely a public relations consideration for Air Canada. There's otherwise "no legal basis" for how a crash or a hard landing would impact investigations, whether for insurance or Transportation Safety Board purposes, said Ehsan Monfared, a legal student with the Toronto aviation law firm Clark & Company. "Those entities will come to their own conclusions as to what transpired, irrespective of how a carrier wishes to cast an event," Monfared said. The firm's founder, aviation lawyer Bill Clark, suggested it was a botched "missed approach," which would involve a pilot electing not to land after approaching the runway, then passing around again to try again. Whatever the cause of the accident, Clark and Monfared agree it was a far cry from a hard landing. "I don't think anybody in the industry would describe the incident of what we've seen in the press so far as a hard landing," Clark said. To read through the Transportation Safety Board's list of aviation investigation reports, visit the TSB website. The entirely predictable media obsession with the tragedy of the Germanwings jetliner that crashed into the French Alps on March 25 is moving forward full force. The media, especially cable television, love airline disasters. Once German prosecutors revealed that Andreas Lubitz, the pilot at the controls of the Germanwings jetliner when it crashed, had a mental illness but had kept the diagnosis hidden from his employer, all media hell broke loose. One of the key questions raised by the spectre of mental illness was whether the pilot's doctors tried to establish Lubitz's mental fitness to fly and if they were concerned should they have revealed their worries to his employer. Despite a whole lot of talking heads jawing on these points few had anything useful to say since almost none of the experts consulted seemed familiar with the accuracy of mental health screening, or with the nature of German requirements for health screenings for crews or mechanics, or with German privacy law. When the discussion shifted to what about America, things still stayed fuzzy. Pilots being interviewed noted that the Federal Aviation Administration requires they receive a physical exam from a flight surgeon annually or every six months as they get older. What mechanics or flight attendants undergo was never mentioned. Mental health is supposed to be a part of the exam for pilots but it almost never is. Pilots and the doctors examining them know that any indication of mental illness including addiction or suicidal thinking would get reported right to the FAA and that would be the end of that pilot's job so little probing gets done. Plus those doing the screening rarely have any training in mental health. Put aside the question of whether one crash, as horrible as it was, might have been prevented by tougher mental health screening of every commercial pilot in the world by trained medical experts. The fact is asking doctors and nurses about mandatory mental health screening and the duty to disclose results to third parties is rather ironic since doctors and nurses who hold lives in their hands every day do not undergo mandatory, regular mental health or drug testing. Thus they are even less likely than pilots to get the help they need to prevent suicide, burnout and depression. Patients are left at risk because their anesthesiologist may be addicted to pain killers, their nurse may have an alcohol problem, their surgeon may suffer from cocaine abuse or their radiologist from early memory loss due to a small stroke or early Alzheimer's. Asking a parade of medical experts about how extensive the testing is of pilots and whether they would report any concerns about mental health misses a bigger issue with more importance then a single plane crash. Safety is a huge issue in health care in America. Too many patients die in our hospitals and nursing homes or are harmed due to errors. What is at the root of those errors is hard to say since we don't require regular mental health and drug testing, much less mandatory reporting to any third party of those involved in providing clinical care. When you hold the lives of others in your hands safety has to be of primary concern. When a pilot crashes his own plane into a mountain we wonder whether that could have been prevented with better medical testing. But, better medical testing and reporting is something that medicine needs as well. It is time to take a long, hard, broad look at which occupations need mandatory testing, for what, how often and with what consequences. Thailand admits it "urgently" needs to improve airline safety procedures as several carriers face bans on new international flights after a UN aviation agency raised concerns. 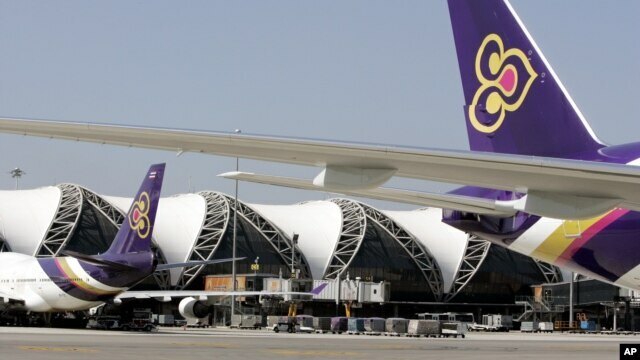 The International Civil Aviation Organization, a United Nations body, reported "significant safety concerns" to Thailand's Department of Civil Aviation after an audit this year. In response, Japan last week blocked new flights from Thailand in a move affecting charter services by budget carriers Thai AirAsia X and NokScoot as well as Asia Atlantic Airlines, the department said, adding existing flights would not be impacted. Flag carrier Thai Airways, in a statement on its Facebook page, said two charter flights scheduled to depart for Japan next month have been affected. Transport Minister Prajin Juntong said Thailand must quickly improve airline safety. "The ICAO has warned us since 2005 about our aviation management and asked us to improve our systems," he said. "I understand we have to improve urgently." The department did not give details of the UN body's concerns but said it would provide new training for its staff and increase airline inspections. 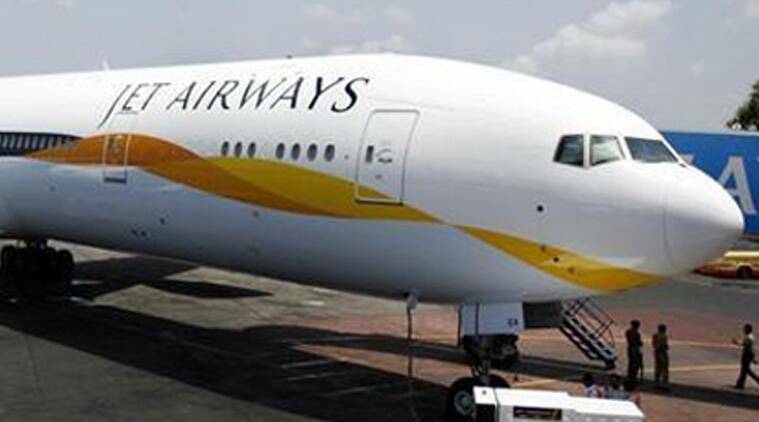 DGCA had initiated an audit into Jet Airways after the airline's Mumbai-Brussels flight, with 280 passengers on board, plunged 5,000 feet over Turkey last week. (Reuters) The Jet Airways aircraft, however, survived without any damage. A Dubai-Mumbai Jet Airways flight with 110 passengers on board made a safe landing after being hit by a bird at the Chhatrapati Shivaji International Airport (CSIA) runway on Tuesday evening. At 4.29pm, the Jet Airways captain informed the ATC about the bird hit. The runway was temporarily shut for an inspection, resulting in four go-arounds (flights asked to abort landing mid-air). These flights included AI's flight from Lucknow and Jet Airways' flights from Kozhikode and Delhi between 4.30pm and 5.04pm. Once the runway was cleared, around 5.04 pm, the captain of a GoAir flight from Chandigarh also reported a suspected bird hit. But runway inspection revealed it was a feather, said an airport official. The Jet Airways aircraft, however, survived without any damage. "The captain of Jet Airways flight 9W 541 from Dubai to Mumbai reported a bird hit while landing. A thorough inspection of the aircraft was carried out and no damage was reported," said the Jet Airways spokesperson. Following the bird scares, around five flights were diverted from Mumbai airport due to traffic congestion at the airport, said MIAL officials. Four Indigo flights were diverted to Ahmedabad and a JetAirways flight was diverted to Vadodara airports. Officials have arrested a woman Tuesday night after she allegedly trespassed onto Mineta San Jose International Airport. SAN JOSE, Calif. (KGO) -- San Jose airport police arrested a woman Tuesday night after a security breach at Mineta San Jose International Airport. Airport officials say the incident occurred at 5:15 p.m. Tuesday at the ramp of the south cargo area of the airport where cargo planes are loaded and unloaded. A UPS employee spotted the female trespasser and alerted San Jose Airport police, authorities said. When police arrived, they tried to make contact with the suspect, but she resisted. Police said they were eventually able to subdue her and make an arrest. The suspect had no identification and refused to identify herself to officers, police said. The suspect was booked into the Santa Clara County Jail for trespassing and resisting arrest. Authorities believe the woman scaled and jumped the fence near the southwest corner of the airport. The suspect then continued to walk eastbound across the airfield until she was contacted by San Jose Airport Police and taken into custody. In the meantime, East Bay congressman Eric Swallwell is calling for more security. "What I have been calling for is perimeter breach notification alerts that will tell you the moment a breach occurs," Swallwell said. This is the fifth security breach at Mineta San Jose International Airport in less than a year. In April of last year, a Santa Clara teenager stowed away in the wheel well of a Hawaiian Airlines jet after scaling the airport's perimeter fence. In August, notorious stowaway Marilyn Hartman bypassed security and flew to Los Angeles. "That lady that could have gone on tonight. She could have had some bombs or something. We don't know what's going to happen, but I think security needs to be bumped up, said Melissa Hernandez, a Belmont resident. A bomb scare has been reported on a Turkish Airlines flight from Istanbul to Lisbon. The plane has returned to Istanbul's Atat�rk Airport and is currently surrounded by security personnel. This is the third such bomb scare on a Turkish Airlines flight in less than a week, with a flight to Tokyo having to make an emergency return landing to Istanbul on Sunday and a flight to Sao Paulo having to make an emergency landing to Casablanca on Monday. The Federal Aviation Administration on Tuesday proposed fining Southwest Airlines $328,550 for not properly inspecting a plane that lost cabin pressure and made an emergency landing and, in a second case, putting off repairs and not accurately logging them. The airline said it did nothing wrong. On May 13, 2013, a Southwest jet made an emergency landing in Baltimore after losing pressure during a flight from Boston to St. Louis. But according to the FAA, mechanics never conducted a mandatory inspection to check for damage and to replace used oxygen bottles. The same plane went on 123 flights before the inspection was completed on June 3. In a separate case, on March 18, 2013, an Air Tran Airways plane operated by Southwest experienced a problem with ice and water coming from its galley vent, the FAA said. Over the next few weeks, crews deferred fixing making repairs by improperly claiming an exemption and did not follow FAA-approved maintenance procedures, which include detailing the issue in the plane's logbook. The plane flew several times before the problem was fixed, the safety agency said. In the first case, the government fined the airline $265,800. In the second incident, the fine was $62,750. In a written statement, Southwest said it did not violate FAA rules. "Upon discovery, each repair was appropriately addressed in accordance with applicable regulations," the statement said. "These items were fully resolved some time ago." 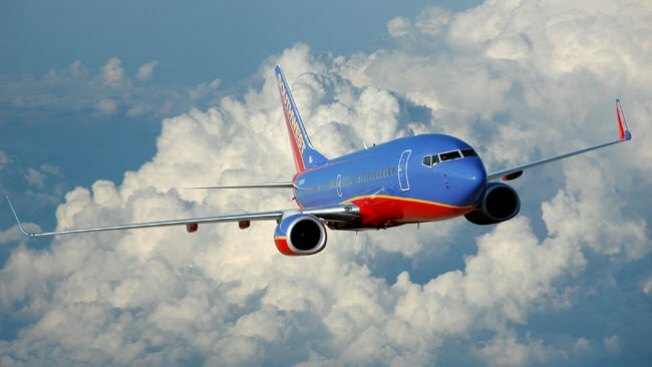 Asked if the airline would appeal the fine, Southwest spokesman Brian Parrish said, "Southwest has requested a meeting with the FAA to discuss each proposed penalty." Just last year, the Justice Department filed a lawsuit against Southwest over $12 million in penalties, which was the second-largest fine ever imposed by the FAA. In that case, the airline was accused of flying 44 planes on more than 30,000 flights in violation of safety rules. At the time, Southwest said it looked forward to defending its safety record in court. The case, filed in federal court in Seattle, is still pending. New Delhi: The pilots of Air India have several pending issues with the airline like continuing pay cut and flying some very old planes. They have now warned of an exodus of pilots from AI unless these issues are resolved at the earliest. An official of the Indian Commercial Pilots Association (ICPA, union of erstwhile Indian Airlines now AI Domestic) said large number of pilots have already quit in the past two years and that many more are serving their notice periods. "The biggest issue is of pay cut that refuses to go away and the fact that AI still operates 26-year-old Airbus A320s," said an ICPA office-bearer. ICPA general secretary Praveen Keerthi has told DGCA M Sathiyavathy that the increasing frustration among AI pilots could affect safety. He wrote, "We wonder how you have ignored the working conditions and plight of our pilots, cabin crew, engineers and all other employees due to non-payment of salary and allowances for the almost 32 months, when you were prompt in this aspect in regard of Kingfisher & SpiceJet employees. How is it that not receiving salary is a matter of flight safety for Kingfisher and SpiceJet staff but not for AI?" New Delhi: National carrier Air India has made psychometric tests a mandatory part of its induction process for pilots and cabin crew. The airline, which faces a shortage of both pilots and cabin crew, started conducting these tests late December while starting a process to hire cabin crew. "We were to hire 350 cabin crew to begin with. We got written tests conducted by the Indian Institute of Psychometry (IIP). A large number of applicants failed these tests. These tests check their psyche and evaluates how would they react and act in various situations," said a senior AI official. AI has been asking the DiA t a time when pilots' psyche has become a major safety concern globally, one of India's oldest pilot unions has raised several crucial questions for the directorate general of civil aviation. The Indian Commercial Pilots' Association, union of pilots of erstwhile Indian Airlines and now Air India (domestic), has asked the regulator to clarify what is the minimum time before schedule departure time that they must report for flying at airports. The DGCA recently issued showcause notices to several pilots for reporting late to work. An AI pilot was issued the notice for reporting a minute late. The union says all Indian airlines have different reporting times for pilots, that start from half an hour before departure time. rectorate General of Civil Aviation (DGCA) since last year to make these tests mandatory for airlines. "From Friday, we started the process of hiring co-pilots. We took the help of an Indian Air Force psychologist for this. In future, all pilots that will be hired by us will have to undergo IIP tests," said the official. The aviation ministry is now planning to call a meeting of all stakeholders to consider making psychometric tests must for flight crew. Some airlines do it without waiting for DGCA to issue orders in this regard. Jet Airways, for instance, said that it conducts these tests for all new pilot cadets. ""These tests are a part of our screening process and reviewed by trained professionals," a Jet official said. IndiGo said that it conducts these tests. An IndiGo official said: "we do a detailed psychological assessment of all commercial pilot licence holders or cadets joining us. This is through the use of the "Crew Assessment and Selection System" psychological assessment tool, which gives us a 12-13 page report on each pilot's personality and psychological makeup, his/her ability to be an effective pilot of a technologically advanced aircraft, and his fit into our culture. This report is a part of the pilot's records during his tenure with IndiGo. Additionally, we require these pilots to also undergo a drug test before final selection." People thought that 'flying saucers' are technologies that are not yet accessible to humans. But NASA proved the world that they successfully built their own which will take part in future mission to visit the red planet. The test vehicle is part of NASA's Low-Density Supersonic Decelerator (LDSD) project, which is specially created for future landing vehicles in near missions towards visiting nearby planets. NASA sent the 15-foor wide, 7,000- pound trial 'flying saucer' that will serve as a vehicle for the Mars mission. People got a glimpse of the trial vehicle during a live broadcast on ABC News last Tuesday, as it underwent a 'spin test' on a table at NASA's propulsion Laboratory in Pasadena, California. According to NASA, the vehicle is "breakthrough technologies that will enable large payloads to be safely landed on the surface of Mars, or other planetary bodies with atmospheres, including Earth." Furthermore, the technology also provides greater access to the surface of Mars by being able to land at higher-altitude sites. Some journalists were invited to get an exclusive view of the test spin in the La Canada Flintridge laboratory. They were asked to stay behind a bulletproof shield once the motor roars to life. In that test, Paul Lytal - LDSD project engineer, said that "What we are trying to do here is to make sure the center of the mass is as close to where the spin motor will go as possible." This June, NASA will fly a test 'flying saucer' vehicle, which is rocket-powered, into the near space. The saucer will leave the site from Navy's Pacific Missile Range Facility on Kauai, Hawaii. They will lift the saucer to a height of 160,000 feet from the ground using a hot-air balloon as big as the Rose Bowl. From there, a rocket will take to an additional 20,000 feet higher to the atmosphere. NASA also conducted a test on the LDSD project last year. The vehicle flew successfully, but there was some trouble with its parachuting deploying properly. Mars' atmosphere is 1% as dense as our planet's with very similar density in the stratosphere. These new deploying technologies that there are testing might serve a great role as astronomers go the Martian-environment. Amazon is testing its drone delivery service at a secret site in Canada, following repeated warnings by the e-commerce giant that it would go outside the US to bypass what it sees as the US federal government's lethargic approach to the new technology. The largest internet retailer in the world is keeping the location of its new test site closely guarded. What can be revealed is that the company's formidable team of roboticists, software engineers, aeronautics experts and pioneers in remote sensing - including a former Nasa astronaut and the designer of the wingtip of the Boeing 787 - are now operating in British Columbia. The end goal is to utilise what Amazon sees as a slice of virgin airspace - above 200ft, where most buildings end, and below 500ft, where general aviation begins. Into that aerial slice the company plans to pour highly autonomous drones of less than 55lbs, flying through corridors 10 miles or longer at 50mph and carrying payloads of up to 5lbs that account for 86% of all the company's packages. Amazon has acquired a plot of open land lined by oak trees and firs, where it is conducting frequent experimental flights with the full blessing of the Canadian government. As if to underline the significance of the move, the test site is barely 2,000ft from the US border, which was clearly visible from where the Guardian stood on a recent visit. 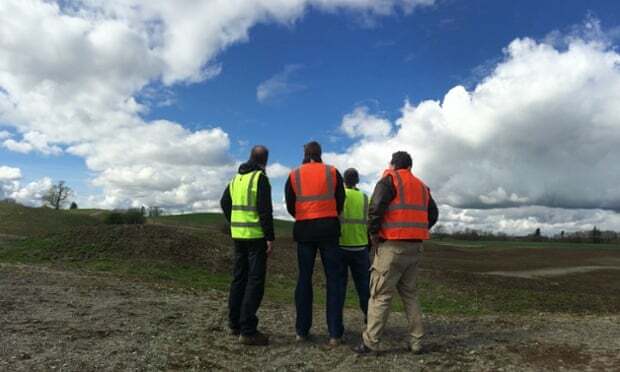 The Guardian was invited to visit Amazon's previously undisclosed Canadian drone test site, where it has been conducting outdoor flights for the past few months. For the duration of the visit, three plain-clothed security guards kept watch from the surrounding hills. Amazon's drone visionaries are taking the permissive culture on the Canadian side of the border and using it to fine-tune the essential features of what they hope will become a successful delivery-by-drone system. The Guardian witnessed tests of a hybrid drone that can take off and land vertically as well as fly horizontally. The company's decision to set up camp in Canada, after frustration in its attempts to persuade US regulators to allow it to launch its drones in Washington state, takes Amazon's quarrel with the federal government to a new level. 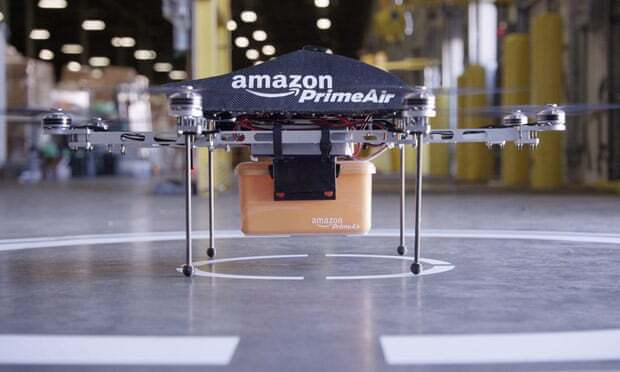 Last week a senior Amazon executive appeared before a US Senate subcommittee and warned that there would be consequences if federal regulators continued to act as a drag on its ambitions to launch a drone delivery service called Prime Air. What Paul Misener, the company's vice-president for global public policy, did not tell senators was that at the very moment he appeared before them, Amazon drones were buzzing in the skies just north of the border. The company wants to offer its customers the ability to have packages dropped on their doorstep by flying robots within 30 minutes of ordering goods online. With innovation in the drone sector reaching lightning speeds, Amazon said it was not prepared to curtail its ambitions because of what Misener said was a lack of "impetus" on the US side of the border. "We think that this new technology will provide huge benefits for our customers, who we think will love it, and for society more broadly," he told the Guardian a day after the subcommittee hearing. "Why would we wait?" Gur Kimchi, the architect and head of Prime Air, said the hope had always been to develop the drone service in the US, close to the company's Seattle headquarters. "But we're limited there to flying indoors and have been now for a very long time. So we do what's necessary - we go to places where we can test outside, in this case Canada." Drone technology is seen by many tech companies and aeronautics experts as the next frontier for innovation, with billions of dollars potentially in the balance. Traditionally, the US has been at the vanguard of both tech and aviation innovation, but the approach of the the Federal Aviation Authority (FAA), a US regulatory body, has been markedly tentative so far compared with that of regulators in Canada and Europe. Brendan Schulman, a New York-based specialist in drone law, said the Guardian's disclosure of Amazon's Canadian airstrip-in-exile should be a "serious wake-up call to politicians and regulators". "America has led the world in aviation development," he said, "but for the first time in history we are at risk of losing out. To see one of our most innovative companies forced over the border is a stark example of the danger." Until it opened its Canadian base, Amazon had been limited to indoor testing in its Seattle laboratory, backed up with research outposts in the UK - in Cambridge - and Israel. Requests by the company to begin outdoor testing on company land in Washington state have so far largely been rebuffed by the FAA. The federal agency recently published its guidelines for commercial use of small drones. The new rules will take at least two years to come into effect, a delay which Amazon finds unacceptable. Last July, the company applied for a so-called 333 exemption that would allow it to carry out outdoor experimentation immediately. Eight months later, the FAA has not responded. The federal body did agree last week, amid considerable fanfare, to award the company a so-called "experimental airworthiness certificate" that can be used to test a specific model of drone. But it took so long for the certificate to come through that by the time it was granted, Amazon said it was obsolete. "The pace of innovation is so great at this point that our designs are changing very quickly," Misener told the Guardian. The contrast between the relative rigidity of the FAA's approach to drone testing and the relatively relaxed regulatory regime in Canada is startling. Under the Canadian system, Amazon has been granted a virtual carte blanche regarding its entire fleet of drones within its designated airspace, having gone through a licensing process that took just three weeks. By comparison, it takes the FAA many months to grant approval. Sources familiar with the process told the Guardian the US regulator insists on an initial 23-page application, a review of 75 pages of further documentation and a four-hour presentation at FAA headquarters followed by a three-hour site visit, together with ongoing reporting and record-keeping obligations. Early experiments in Canada have focused on a range of individual drone capabilities: sensors that can detect and avoid obstacles in a drone's path; link-loss procedures that control the aircraft should its connection with base be broken; stability in wind and turbulence; and environmental impact. Once each of these facets has been perfected, a new Amazon prototype drone will be assembled that Kimchi predicted would be utterly safe and wholly unlike anything seen before. "We are going to end up with unique shapes, unique vehicles. The most important part is to develop strong confidence that our system is safe and that we can demonstrate that to customers," he said. "You can build a very different world. It can be faster, and safer, and more economic and more environmentally friendly - all of those things, all at the same time." The FAA argues that the US has a uniquely difficult job in safeguarding the nation's skies. It emphasises that it is responsible for the largest, most complex airspace in the world, which, unlike other countries', is used by a large general aviation fleet. "Different laws and regulatory structures in other nations may allow them to act more quickly to approve certain UAS [drone] operations," an FAA spokesman told the Guardian. "Everything we do is safety-oriented, and we base our approvals for unmanned aircraft operations on an assessment of the risks to other aircraft and to people and property on the ground. We have been working diligently with Amazon to get the information we need." Misener said he respected the FAA's desire to keep America's airspace as safe as possible. "That's our top priority in Amazon Prime Air too," he said. But he questioned the FAA's portrayal of America's unique position: "The US does have a complex airspace, but it's no more complex than in Europe, where regulators do allow testing, and it's certainly not complex beneath 500ft or in rural areas of Washington state where we had planned to operate." The numbers speak for themselves. The FAA has received more than 750 requests for outdoor drone testing licenses from American businesses, Amazon's among them, but so far has granted just 48. Canada's equivalent civil aviation authority, Transport Canada, released 1,672 commercial drone certificates last year alone. Diana Cooper, head of drones and robotics at the Canadian law firm Labarge Weinstein, said that in recent months several US companies had contacted her to inquire about opportunities in her country - a phenomenon that she believes will be boosted further by Amazon's decision to join the fold. "Amazon will definitely be a trendsetter," she said, "and will result in a lot of other large American companies like Google and Facebook looking at our market as well." Another battle is already on the horizon. The FAA has stated bluntly it does not believe that drones can be flown safely under their own autonomous control, and is insisting that humans must keep them within eyesight at all times. That is a deal-breaker for Amazon Prime Air, which could only function if drones were able to fly well beyond visual line of sight. Here too, the contrast between the uncertainty of the US regulators and the can-do attitude of their Canadian and European equivalents is striking. A huge area of Alberta covering 700 square nautical miles of restricted airspace has already been set aside to allow for drones to be tested beyond visual line of sight. In Europe a similar facility is being opened in Wales. Misener believes that with such opportunities exploding beyond US borders, it is only a matter of time before the FAA is forced to accept that drones are here to stay. "This technology is going to work," he said. "It's coming." The International Business Aviation Council (IBAC) announced yesterday that it has purchased business aviation safety data firm Robert E. Breiling Associates. "IBAC is proud to continue the authoritative work of Robert Breiling, who has earned the industry's respect over more than four decades," said IBAC director general Kurt Edwards. "Sustaining his safety-data work into the future is critical to allow IBAC to continue providing meaningful information on continuous safety improvement of the global business aviation community, areas to target where risk is the highest and safety trends to inform better safety regulations." IBAC, NBAA and other IBAC member associations, insurance companies, manufacturers, operators and safety regulators have all used Breiling's data since the 1960s. Breiling provides quarterly and annual reports and analysis on turboprop, turbine aircraft and helicopter accidents, identifying where and how occurrences happen, their causes and the critical phases of operation of each aircraft. This data also has been the foundation for the IBAC's annual Business Aviation Safety Brief. The association intends to continue providing such analysis to the industry and is considering additional products based on the data. IBAC will also explore cooperating with ICAO on data exchange to foster greater understanding of global business aviation operational safety.